Arcam acquired by Harman, a division of Samsung | What Hi-Fi? The deal was announced in an email to Arcam customers. The partnership promises to "accelerate exciting innovations that will benefit our brands". Arcam, one of the best-known brands in British hi-fi, has been acquired by Harman International Industries. Harman is a division of a Samsung, following an $8 billion deal last year, and the owner of audio brands including AKG, JBL, Lexicon and Mark Levinson. In November 2012, Arcam had become a wholly owned subsidiary of JAM industries, based in Montreal. The news was revealed in an email to Arcam customers from Scott Campbell, director of sales and marketing at Arcam. 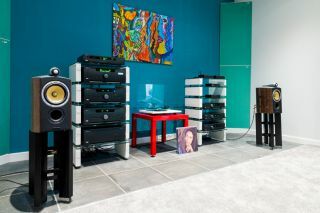 "Arcam and Harman share a like-minded passion for bringing the highest quality sound into people's lives," the email reads. "Harman recognises the value and potential of Arcam’s people, technologies, and brands, and we expect the combination will deliver growth opportunities and benefits to our customers. We believe this is an unprecedented opportunity to grow Arcam’s engineering capabilities and extend its product reach into new markets." The existing management team in Cambridge, England - where Arcam, originally A&R Cambridge, was founded - will remain, as will sales and distribution channels in the US. Arcam managing director Charlie Brennan adds: "Becoming part of Harman will give us access to technology and resources that should give us the means to develop better products in the future. "I don't envisage any sudden moves - it's business as usual for all of the Arcam team. I believe we can make a big difference to the high-performance brands that Harman has owned for years and will continue my quest to save the world from bad sound with a bigger and stronger company behind us." Let's hope the Arcam hi-fi and home cinema products benefit from the partnership.